So take Noises Off, add a touch of Patrtick Barlow’s 39 Steps, a hint of Moulin Rouge without the songs, and marinate in La Belle Époque and you get a taste of what to expect. For a start there is a cast of more than 50 characters, but only 14 actors to play them, indeed Freddie Fox, as Edmond, is the only one who knows who he is from one minute to the next . . .possibly. 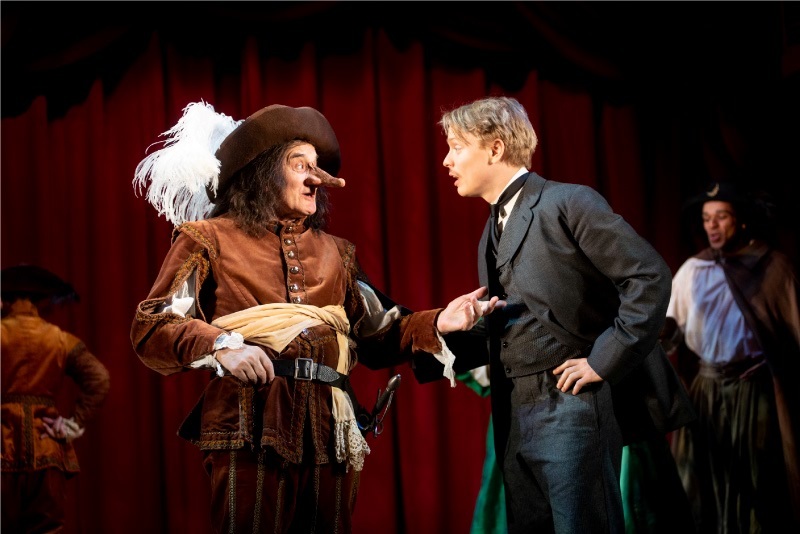 He plays Edmond Rostand, French poet and dramatist, and we join him in this Birmingham Rep co-production as he builds up towards his smash hit play of 1897, Cyrano De Bergerac. But we open with another of his plays, The Distant Princess, which is an almighty turkey. starring his friend and celebrated star of the age, Sarah Bernhardt - cruelly described as a monument no one wishes to visit. Sarah never made it into the cast of Cyrano though, so Josie Lawrence, who plays her with diva delight, finds herself roped in as a waitress, an ancient actress with a nice line in acerbic comments and Suzon, a working girl as they are euphemistically called, a tart with a heart from the Aux Belle Poules, literally To The Beautiful Hens . . . hens being another word for ladies with love for sale in France. And all that is historically accurate(ish) the ish being the brothel, which did exist, and ran to 1946 – but didn’t open its doors for another seven years after the play opened. C’est la vie . . . Famous(ish) Rostand has that dreaded disease of the literati, writer’s block which has created rapidly approaching penury until, almost by accident, he finds he has a play he hasn’t actually written wanted by celebrated actor Constant Coquelin who is equally desperate for a hit show. Henry Goodman is a delight as the actor who was a French legend, sweeping around the stage in his feathered hat, dismissing any problems as something for someone else to worry about and giving Rostand impossible deadlines. Benoît-Constant Coquelin did exist, and was the star of Cyrano back in 1897, but whether he was desperate for success, being one of the most famous actors of his age, appearing in London and New York, is perhaps open to question. Another fact is Rostand’s wife Rosemonde, played by Sarah Ridgeway, who fears she is losing him when she finds love letters to dresser Jeanne, played by Gina Bramhill. Edmond’s best friend Leo, an actor with more in his trousers than between is ears, is in love with Jeane, but without a script he cannot find words, or at least anything near the right words, to express his feelings. So, Edmond offers to help out. but the offer becomes an obsession, a love affair in words only as Rostand uses the letters as a sort of workshop for his play about Cyrano, an ugly man having a love affair by proxy. There are some lovely performances with the larger than life Chizzy Akudolu as Maria, actress and one time employee as one of the beautiful hens. She is the choice of a sort of Parisienne cockney dodgy underworld brothers, Ange and Marcel Floury, (Nick Cavaliere and Simon Gregor) who both believe they are the father of her 10-year-old son. Their deal is simple - employ her or we won’t finance your play. Maria complains about not enough lines, then too many, and probably complains when she has nothing to complain about. Coquelin, his friends call him Coquie, wants his son, Jean, in the play, but Jean, played by Harry Kershaw, does not want to be an actor, he wants to be a pastry chef and, it appears, his lack of experience in matters of romance, are also affecting his performance . . . in more ways than one. So, enter Suzon, coupled with a rewrite to include a pastry chef in the cast, and two problems are solved in moments. Around all this we have Luke Elliot popping up as Stanislavsky, Cavaliere as Lumière and David Langham as Ravel, Feydeau and Chekov. Then we have Delroy Atkinson, as Monsier Honoré, the elegant owner of the popular café, who acts as a sort of Greek chorus. Director Roxana Silbert has kept things running at a breakneck pace on Robert Innes Hopkins clever set, with some clever touches such as the trains, or the hotel with Simon Gregor as a receptionist with a Fench accent that could have been imported from Monty Python. 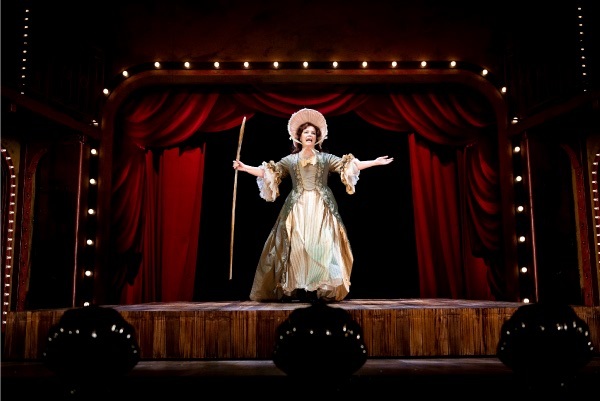 The proscenium is decked in wonderful velvet drapes that could have been borrowed from the Moulin Rouge set while Jeremy Sams translation has worked in some lovely lines in what is a witty farce.